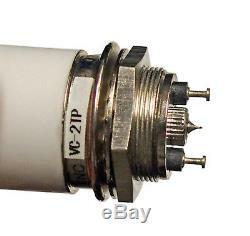 New VC-2 Vacuum SPDT Antenna Relay 12 VDC for High Power Amplifier Builder. The relay is a SPDT configuration and operates from 12 vdc with slightly more than 100 ma current draw when activated. 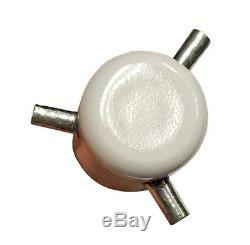 The relay measures approximately 2.25 high and the body is 1 inch diameter. 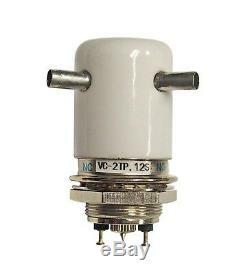 The product is equal to a Jennings RJ2B-26 or RJ6B-26 vacuum relay. The relay will easily switch 5000 watts or more for an HF linear amplifier. The relay is a replacement part in the Henry 8K Ultra, 5K Classic and 3002A. This is new inventory at the Henry amplifier factory in Los Angeles, California. The item "New Vacuum SPDT Antenna Relay VC-2 12VDC for HF Amplifier Greenstone" is in sale since Friday, November 3, 2017. This item is in the category "Consumer Electronics\Radio Communication\Ham, Amateur Radio\Other Ham Radio Equipment". The seller is "henryradio" and is located in Los Angeles, California. This item can be shipped worldwide.